Two more bodies have been retrieved from the debris of the collapsed under-construction flyover in Kolkata. The two bodies were extricated from underneath the pile of debris and iron girdles during the rescue operations on 2 April. A senior Kolkata police official told PTI that the number of people injured in the mishap stood at 89. He also warned that the foul smell emanating from the debris implied that more bodies would soon be found. "Going by the foul smell, it seems there are more bodies underneath the debris... We are trying to find them," the officer said. 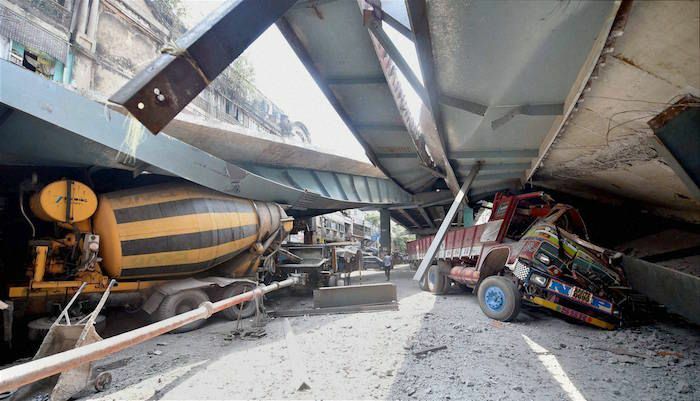 A 60-metre-long stretch of the 2.2 km under-construction flyover in North Kolkata's Girish Park area collapsed on a congested road intersection on 31 March. "This area is quite critical because of its proximity to residential buildings along the road. We were getting foul smell from underneath the rubble, but we have to be very cautious while carrying out the rescue work... One wrong step can lead to another mishap by bringing down the other part of the flyover," the officer said. The West Bengal government has ordered a high-level probe into the tragedy that triggered a blame game with the opposition accusing the Mamata Banerjee government of callousness. Three senior officials of the Hyderabad-based construction company IVRCL were arrested by the Kolkata Police on 1 April in connection with their probe into the mishap. The state government has also suspended two engineers of the Kolkata Metropolitan Development Authority who were involved in the construction of the flyover. "The concerned chief engineer and the concerned executive engineer of KMDA have been placed under suspension pending completion of the probe," a statement from the state secretariat 'Nabanna' said. It also ordered immediate inspection of the remaining portion of the flyover to ascertain its stability and safety. Police has registered a case against the construction firm under sections 304, 308 and 407 of the IPC and sealed its local office. Has Kareena Kapoor replaced Priyanka Chopra in Sanjay Leela Bhansali's Gustakhiyan? READ NEXT >> Has Kareena Kapoor replaced Priyanka Chopra in Sanjay Leela Bhansali's Gustakhiyan?